If your Antivirus subscription ran out and you were looking for a good alternative, you are in luck. For 24 hours, SharewareOnSale are giving away a 1 year license for AVG Internet Security 2014 for Free. Technically this is actually just a 1 year trial license, but its still worth grabbing, as the normal trial period is just for 30 days. And a 1 year license normally costs $54.99. The features in the trial and full version are the same, you will get all free database updates and minor program updates. i.e No free update to a major version like AVG 2015. 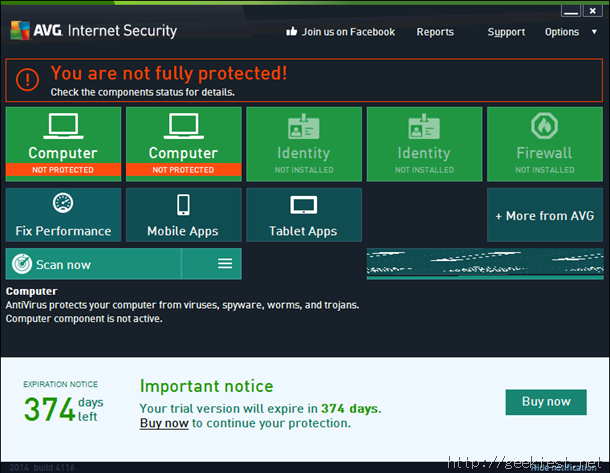 If you have previously used AVG Internet Security on your computer, you cannot use this trial license. Go to the promo page at SharewareOnSale and create a free account. Then place your order for AVG Internet Security 2014 and check out for free. You will get an email with 4 links in it, one is for the 32 bit version of the Antivirus, and one for the 64 bit version. The other two are the mirrors for the 32 & 64 bit versions. Just download the version you need and install it. That is all you have to do to get your 1 year trial license. Note: You must download and install the software today to activate the license.